Panning and zooming a map can be time consuming and a pain in your wrist. One way to provide easier map navigation is by adding a search box. A search box lets users to jump to a location quickly and easily. Now it is easier to add a search box that does just that by using the Search widget with the ArcGIS Global Geocoding service, your own custom geocoding service(s), and/or feature layer(s). In this tutorial, you will add the Search widget to a basic map which allows your users to easily search for locations. Once added, we will go through a few customizations that can be applied to the Search widget. Require the widget and additional modules. Create an element in your HTML document to house the widget. Specify a style to position the widget over the map and make the map fill the entire page. Create a map and create an instance of the Search widget. As the second parameter to the Search constructor, pass a reference to the node where you want to attach the widget. This node already exists in our HTML document and has a an ID of "search". This sample specifies the minimum required Search parameters. After creating the widget, be sure to call startup(). The Search widget bases its search off of sources. These sources can be either geocoding service(s), or feature layer(s). Since nothing is specified, it automatically defaults to the ArcGIS Online World Geocoding service. The Search widget has additional capabilities such as constraining the search results to a specified extent. The widget's source has a searchExtent option which takes an array of extent objects. This option can be applied to both locators and feature layer sources. 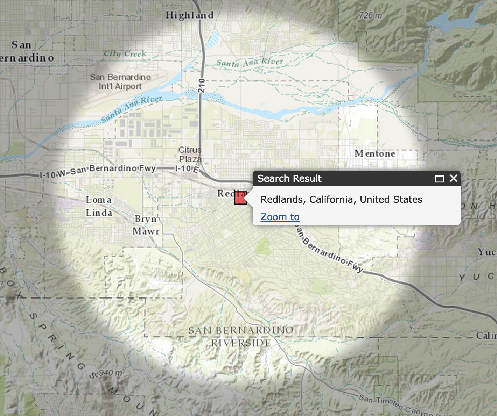 In this example, the search extent is set to a pre-defined extent that encompasses the City of Redlands and its surrounding area. The next couple of code snippets will add a spotlight effect which highlights the selected location. Add code that adds a spotlight div to the map container once the map loads. Finally, add logic to remove the spotlight when the search input is cleared. //make sure to start up the widget! var html = "<div id='spotlight' class='spotlight'></div>"
The Search widget allows you to search fields in a feature layer to use along with or in place of a geocoder. In the following step, you first get a reference to the search's sources. After this, you will push a new source object back to it. This object can be either a locator or feature layer. In this specific case, we use a feature layer and provide additional properties to specify the field to search, how the suggestions should display (suggestionTemplate), in addition to a few other configurable settings. Additional Search samples are available in the Search category of the samples section of this site.